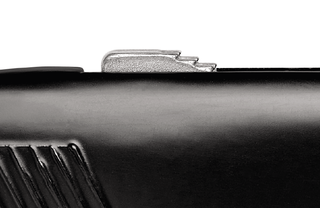 The SECUNORM REGELSAFE is nothing less than its "heavy brother", the SECUNORM MULTISAFE. It is just made of a lighter aluminium. 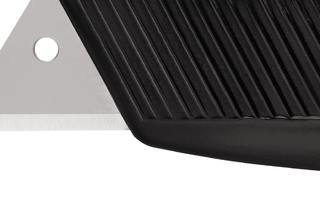 The lighter weight knife ensures lower fatigue during frequent cutting throughout the shift. The slender and robust safety knife is also suitable for all the usual cutting materials. This is also because the dimensions of the blade extension are so generous. As you can see and feel, the SECUNORM REGELSAFE is extremely stable. And flexible, since you can use a large number of blade shapes. The product is therefore suitable for any cutting application. Except power cuts. The SECUNORM REGELSAFE is a tool cast as one. Abrasion resistant aluminium, to be precise. For certain industries, e.g. the food industry, this product also exists unpainted. With the left hand or the right hand, you ask? With both! The metal slider is on top of the handle, and so can be easily used by both thumbs. Before you have to change the quality blade, you can turn it over once. This doubles the usage time of the blade - and reduces your energy consumption. Because your SECUNORM REGELSAFE will cut again like new. Even in the case of a classic such as the SECUNORM REGELSAFE you do not have to do without a practical eyelet. So that you can always attach your cutting tool easily and safely.